There are dozens of SEO Blogs that offer tips and advises to up-and-coming and professional SEOs, but are you really sure they offer the best advices. We’ve listed 10 of the best SEO Blogs with the reputation, traffic and reliability that made them the bibles of the SEO world. With over 1,400,000 unique visitors and an Alexa rank of 1,036, SEOBook is no wonder the leading SEO Blogs today with thousands of pages to help you look for the right tools, resources, tutorials and reliable contents when it comes to SEO, affiliate marketing and other internet-related ventures. Moz boasts of more than 700,000 unique visits a month and an Alexa Rank of 1,946. It is the original SEO Blogs offering various resources to make it through the cut-throat online competition. Search Engine Land attracts around 650,000 unique monthly visitors and has an Alexa rank of 2,485. It is home to the hottest and most valuable information in the field of SEO with seasoned writers and experts in the industry regularly give updates on marketing strategies and search engine optimization. With an estimated unique monthly visitors of over 645,000, Search Engine Watch is ranked 3,022nd by Alexa. Search Engine Watch shares authoritative and helpful free tutorials and information on SEO and Google updates. SEJ has a unique monthly visitor of almost 550,000 and an Alexa Rank of 3,275. Here you can find interesting articles about SEO plus free daily tips on how to optimize your websites for free. All the big names in the SEO world also contribute here. 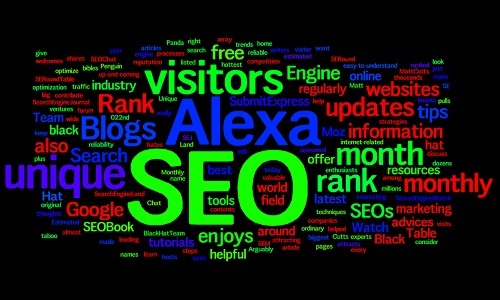 With more than 500,000 unique monthly visitors a month, SEO Chat enjoys an Alexa rank of 2,235. It’s popular among SEOs because of the wide array of information on optimizing and monetizing websites in easy-to-understand steps and processes. Arguably the biggest name in the industry, Matt Cutts regularly updates his websites with tips and thoughts on the latest trends on SEO. Estimated Unique Monthly Visitors: 440,000. Alexa Rank: 4,524. Black Hat Team is an online forum where black hat enthusiasts discuss and share techniques. While Google hates black hat and legit SEOs consider it a taboo, Black Hat Team still pulls an average of 400,000 unique visitors a month and enjoys an Alexa rank of 1,003. SE Round Table welcomes around 400,000 a month as enjoys 5,815 in the Alexa Rank. If you want to learn more about SEO and keep your eyes on latest Google Panda and Penguin updates, then, SERound Table is where you should be. SubmitExpress has over 390,000 visitors every month and an Alexa rank of 2,834. It’s not just an ordinary SEO Blogs, it’s also an SEO company that has helped nearly 6,000 companies succeed in the field of SEM and SEO. The website also hosts helpful tools for article submissions, attracting millions of visitors a year. Manilyn Moreno is an online marketing and content manager. Currently, she is spearheading the SEO campaign for software for catering. Thanks for sharing this list with us, really appreciate it. Hope to see more like this one in future, on your blog. It took you a lot of time to put all popular forums together? Anyway, you have done wonderful job here. Created in 2006, now the forum combines 2 main languages – English and Bulgarian. Great place to get help and trade resources. It is the most popular one in its country and with the time – one of the most popular in Europe. The atmosphere there is friendly and everyone is ready to help you at any time and about everything.